at affordable prices throughout the Chicagoland area. we’re proud of our many accomplishments and our countless great reviews . T&D Electrical is an locally-owned electrical contractor providing award-winning service by our master electricians in the Chicagoland area. We serve both commercial and residential properties with a wide variety of services, including installation, repair, standby generators, and more! Service Calls include all types of lighting and wiring, with an emphasis on efficient and courteous service. 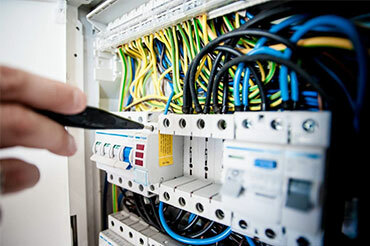 Trust the expert electricians at T&D for work which will hold up to your highest standards..
For complex and rugged electrical projects, our technicians can handle any challenge you encounter. Installing a generator is a great idea for homes and businesses in case of emergencies. T&D offers a unique service in bucket trucks with extended heights allowing service in hard-to-reach places. T&D Electrical has achieved a great reputation as seen in our 5-star ratings on Yelp, as well as our A+ rating from the Better Business Bureau. Our great service shows. We’ll provide you with the same 5-star performance on your electrical project for the service you expect from a professional. We have been bestowed with the coveted Angie’s List Super Service Award several years running. It’s a testament to our dedication and hard work every single day. We bring that dedication to every project we work on because we are always striving to be the best. Our professional electrical contractors are ready to take your call when you need us most. We’ll be there as soon as possible and we’ll fix the problem just as fast. We understand that without our quick service, your electrical issue can affect much more than just your power. No matter what the electrical issue might be, we can handle it. We service both commercial and residential customers with the same dedication to great service everywhere we go. You can count on us to fix the problem through our experience and professional working knowledge that goes above and beyond. Contact us for prompt and efficient electrical service, but we also offer fair pricing no matter what the issue might be. It’s affordable electrical service you will be happy with. Our vision is not only to provide the highest level of electrical service, but it’s also to do it at a price that is convenient for you. When you call T&D Electrical, you are calling on trained professionals that know how to get the job done. We are fully licensed, bonded, and insured for your peace of mind. You will always receive the best possible electrical service from a trusted and experienced professional with a full range of capabilities. From day one, our goal has been to provide Chicago’s homeowners and business owners with the highest level of electrical work available. Since our inception, we’ve received a 5-star rating on Yelp and an A+ grade from the Better Business Bureau. We’re also the proud recipients of the coveted Angie’s List Super Service Award several years running! We work hard to bring the best service to our customers every day, and we’re deeply honored to receive these prestigious awards. Each and every time we receive these accolades, we redouble our efforts and our commitment to bringing you the highest level of care every time. Chase QuickPay using our email address [email protected] You do not need to be a Chase customer to use this non-fee payment method. Visit http://www.chase.com/QuickPay and follow the instructions to enroll.